The head of so-called Islamic State (IS) in Afghanistan, Abdul Hasib, has been killed in a military raid, US and Afghan officials have said. He died 10 days ago in an joint special forces operation in eastern Nangarhar province, the US military said. Hasib is believed to have been behind March's attack on a military hospital in Kabul, killing at least 50 people. Two US army rangers also died in the raid, near an underground system of tunnels believed to be used by IS which were targeted by the largest conventional bomb ever used by the US. There has been no confirmation of the death by IS. Abdul Hasib was appointed as the leader of IS in Afghanistan last year after his predecessor was killed in a US drone strike. He is credited with masterminding the Kabul hospital attack, although some Afghan security experts questioned whether a group still thought to be relatively small in Afghanistan could be capable of planning and carrying out such a large scale operation. In addition to killing Hasib, the US military said US and Afghan forces had killed or captured hundreds of IS militants in an offensive this year. "To date, the campaign has liberated over half of the districts that IS controlled, which has allowed local residents to return to their homes for the first time in more than two years," the statement said. There is no independent confirmation of the claims. Sediq Sediqi, a spokesman for the Afghan president, blamed Hasib for the hospital attack and congratulated the military for killing him. "AFG Special Forces hunted down the leader of IS in Afghanistan; big success for our heroes," he tweeted. IS announced it was moving into Afghanistan and Pakistan when it declared its so-called Khorasan Province (sometimes called ISIS-K) in 2015, and has since carried out a number of deadly and high-profile attacks. In July 2016, a suicide bomb attack on a Shia Muslim rally in Kabul killed about 80 people. Three months later, two similar attacks during the Shia religious festival of Ashura claimed about 30 lives, and in November 2016 an attack at a mosque in Kabul killed more than 30. IS also claimed a suicide attack at Kabul's Supreme Court in February that killed 22 people, and the group has stepped up activity in both Afghanistan and Pakistan. 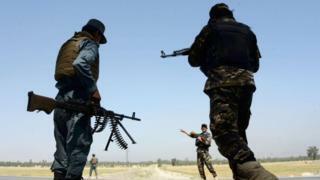 But it has faced armed opposition from the larger and more powerful Afghan Taliban - correspondents say as a consequence, IS has struggled to increase its support or the amount of territory it holds in Afghanistan. Its main strongholds are in the eastern provinces of Nangarhar and Kunar. The failure of IS to widen its political and territorial base in Afghanistan is one reason advanced by analysts for its focus in recent months on headline grabbing attacks in the capital and elsewhere.